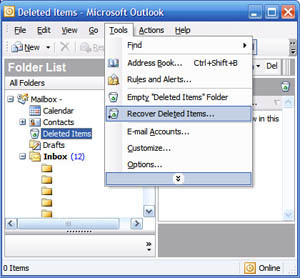 For those of you who work in IT and manage an exchange server, at some point you've probably all faced the situation where a user came to you asking to recover an item that was lost, after said user emptied their "deleted items" folder. Most of the time the solution to their problem is an easy one. Voilà, the items that were selected are now supposed to be back in your Outlook trash can. The only problem with this extremely useful feature is that if a user deletes items using [SHIFT] + [DELETE], the items will get permanently nuked and the recovery utility will not be able to restore them back to their previous location. Right-click the "Options" Key, select "New"->"DWORD Value" and name it "DumpsterAlwaysOn"
Now that you have done the proper modification to the registry, start outlook again, select the folder where the desired item was hard deleted, head over to the tools menu and click "Recover Deleted Items". You should now see all the mails that were hard deleted in the previously selected folder. An important thing to note though is that emails will remain in the recovery utility for as long as the exchange server was configured to retain deleted objects. If you enjoyed this post, take a few seconds of your time and subscribe to our feed! [GAS] is updated multiple times per day and is enjoyed by over 150000 unique visitors each month. Technology, science, news, data recovery and social issues for geeks.